Those looking for a romantic weekend break or a short break with the family need look no further than Farm Stay Norfolk cottages and B & Bs in Norfolk. Our accommodation is located in rural locations the heart of the Norfolk countryside, in The Norfolk Broads and on The Norfolk Coast. For those looking for a couples weekend break, Norfolk has an abundance of wonderful gardens, castles and country homes to explore- Sandringham, Oxburgh Hall, Norwich Cathedral, and Baconsthorpe Castle- to name but a few. 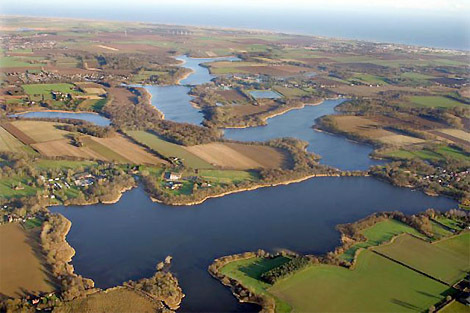 As well as beautiful and imposing man-made structures, Norfolk also has outstanding natural beauty. The Norfolk Broads offer miles of walking in fantastic rural surroundings, a perfect day out in the sunshine, with Hickling Broad and Barton Broad being two highlights. We have Holiday cottages in Hickling, Neatishead & Ludham. Norfolk is also a great place for a short break with the family or with friends. The Great Yarmouth Pleasure Beach is a pleasure park located right on the seaside and is sure to be a hit with children. The Pleasure Beach has rollercoaster's, go-karts, a haunted house, a log flume, a 4D cinema and much, much more. If thrills and spills are not your thing the Banham Zoo is another wonderful day out for the family, with loads of animals, birds of prey displays, and even a Farm Barn, Banham Zoo will keep the family occupied for hours. Norfolk is ideal if you are looking for either a weekend away or a short break mid-week. There is plenty of entertainment for both adults and children and with a Farm Stay cottage or Norfolk B&B your break will be complete, thanks to the high quality of our accommodation and the beautiful surroundings in which they are located. For those looking to beat the crowds whilst still visiting top attractions, our out of season rates are significantly lower than those in the school holidays, meaning you can enjoy all the same quality for less. We have B&B near the Norfolk Coast and B&B near Norwich. To find options for short breaks or weekend breaks in Norfolk, please use the search links on the left of this page with ‘Norfolk’ as your destination.